Successfully Added 2-in-1 HDMI and Camera Connection Kit for iPad 2 to your Shopping Cart. 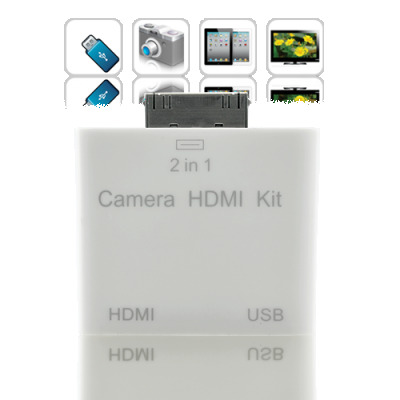 2-in-1 HDMI and Camera Connection Kit for iPad 2, mirror everything from your iPad 2 screen on to your HDTV! Put your movies, photos, games, applications, and everything else from your iPad 2 screen on an even bigger screen — your high definition television. This unique iPad 2 accessory mirrors exactly what you see on your device so that everything in the room can enjoy and join in on the fun. The HDMI connection is easy and convenient, just connect one end to your iPad 2 and the other to your widescreen TV, video projector, or other HDMI-compatible display - no need for setup or software installation! But that's not all, this amazing iPad 2 accessory also includes a USB port which lets you conveniently import photos and videos from your digital camera or USB flash drive to your iPad 2. Once again, just connect the devices together and you're ready! When you want to instantly and conveniently transfer pictures and videos to your iPad 2, it doesn't get easier than this. This 2-in-1 HDMI and Camera Connection Kit for iPad 2 is so easy and so convenient. Wow your friends, wow your family, and wow yourself! The wholesale price makes this essential iPad accessory even more appealing and is brought to you by the leader in wholesale electronics, Chinavasion. Mirror everything from your iPad 2 onto your television! Instantly transfer pictures from your digital camera to your iPad 2! Unique 2-in-1 design, hard to find anywhere else! Please note: Mirroring function supported only by the iPad 2 and iOS 4.3+. Video output (HDMI): 1024 x 768 using a 720p scan rate. For use with the new iPad 2! Is this like the Apple Digital AV Adapter from Apple? The functions are similar, but this 2-in-1 HDMI and Camera Connection Kit for iPad 2 comes in a convenient 2 in 1 design, which means 1 less iPad accessory to keep track of! Of course, you also get our amazing wholesale price. Will this work the same way with an iPhone and iPad 1? Mirroring is only for the iPad 2. If your iPad does not detect the USB flash drive, try creating a folder called "DCIM" and move all your media files there.